The first of its kind, A Companion to Ancient Aesthetics presents a synoptic view of the arts, which crosses traditional boundaries and explores the aesthetic experience of the ancients across a range of media—oral, aural, visual, and literary. Pierre Destrée is Associate Researcher at the FNRS and Associate Professor at the University of Louvain, Belgium, where he teaches ancient philosophy. He is the author of a French translation of Aristotle's Poetics (2014) and editor of Plato and the Poets (with F.G. Herrmann, 2011), Plato and Myth: Studies on the Use and Status of Platonic Myths (with C. Collobert and F. Gonzalez, 2012); The Cambridge Companion to Aristotle's Politics (with M. Deslauriers, 2013) and What is Up to Us? Causality and Responsibility in Ancient Philosophy (with R. Salles and M. Zingano, 2014). Penelope Murray was Senior Lecturer and a founding member of the Department of Classics at the University of Warwick, UK, before retiring in 2008. She continues to work on early Greek poetry and poetics, on philosophical responses to Athenian song-culture, especially the views of Plato, and on ancient literary criticism. Her publications include Genius: The History of an Idea (Blackwell, 1989); Plato on Poetry (1996); Classical Literary Criticism (2000); Music and The Muses: The Culture of Mousike in the Classical Athenian City (edited with P. Wilson, 2004). 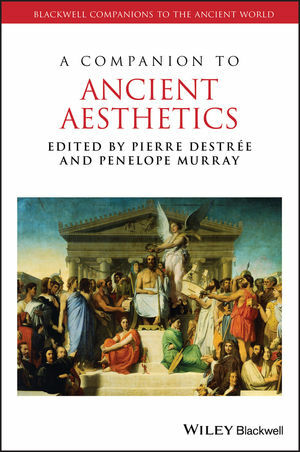 "The editors conceive of “ancient aesthetics” broadly, as encompassing “the multifarious ways in which the arts were experienced and conceptualized in the ancient world” (p. 1). The thirty-three chapters that make up the volume are similarly wide-ranging in focus and disciplinary approach, while the insights afforded by their interconnections show the value of treating ancient aesthetics as a unified field of inquiry. Most of the essays would serve as excellent starting points for research on their topics, and several make important new contributions to scholarship. This book is now the most comprehensive resource available for helping us understand how the Greeks and Romans thought about art."